The majority of car break-ins reported involve cars parked in the owners’ driveways that are UNLOCKED. No matter where you park (i.e. home, gym, coffee shop, store or gas station) ALWAYS LOCK YOUR DOORS. This type of theft is usually a crime of opportunity. 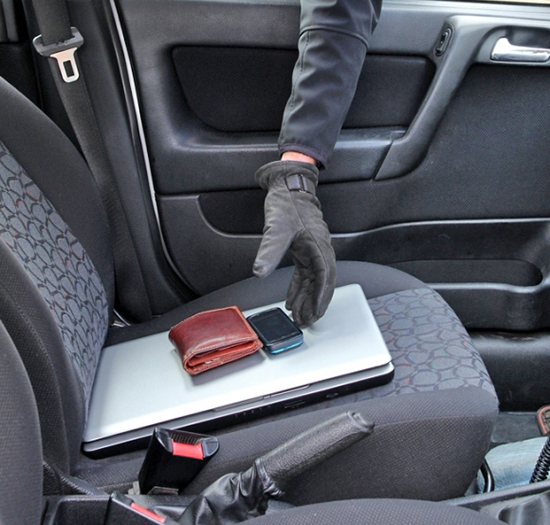 GPS units, IPods, phones, laptops, and cash are tempting invitations for your car to be broken into. Secure the valuables in the trunk or take them with you. Do this prior to your destination in case the thief is watching in the lot. Visible loose change and gift cards are some of the most common items taken. When parking at home, if possible, park in the garage or close to the house. The outside area should be well lit or have a motion light upon approach to the cars. Lock all doors and windows and remove valuables. It is also a good idea when parking at home to remove all keys and garage door openers from the car to prevent access to your home. When parking in public, if possible, park in well-lit highly visible areas. During holidays or retail shopping days, lock packages and purchased items in the trunk. If you are going to continue shopping, you could move your car to a different location in case a thief has been watching the area. If you’re making even a quick trip to the gym, to get coffee, local store, or the gas station all valuables should be secured in the trunk or removed from the car. If you’re only going to be somewhere for a short period and those items aren’t necessary LEAVE THEM AT HOME! DIAL 911 and DON’T TOUCH the car or the contents. An officer will respond, view the scene, and have the vehicle dusted for fingerprints and photographed if possible. Inform the officer of the last time the car was secured or viewed and if you notice any items out of place (i.e. items on the floor or glove box contents on the seat). Provide serial numbers, descriptions, or photos for any electronics or high valued items missing.